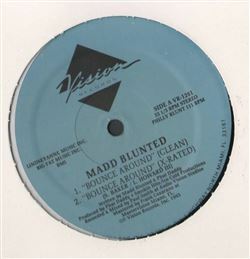 Madd Blunted - Bounce Around 12"
HIP HOP, Vision, USA, 1993... Bass Music with Bounce Around (Clean), Bounce Around (X-Rated), Shake It (Clean), Shake It (X-Rated) feat. Fresh Kid Ice and Gangsta T.
Longshot - We Here / Powerful Gun (Remix) 12" T-K.A.S.H. - In My Drawz / Made In America 12" A.G. / Design / Grip Grand - Look Records Sampler 2005 12" Solution - Bit*h (Back In The House) / Regardless / The Oath 12"
Dirty Dawgz - Dirty Dawgz / Damn 12" Ismalia - Mark Of The Zebra 12" Omni - Ballyhoo 2X12" Cise Digga - Pump Ya Brakes 12"